One application of virtual worlds is simulating real world locations. Using sensor readings these simulations can respond to real time physical and environmental changes; lighting, weather, movement, etc. Using actuators they can affect the real world; controlling fans, lights, heaters, etc. This synchronous combination of augmented reality and augmented virtuality is called cross reality. VTW is a novel method for exploring cultural heritage sites and their associated digital content using a tablet computer as a ‘window to the past’. 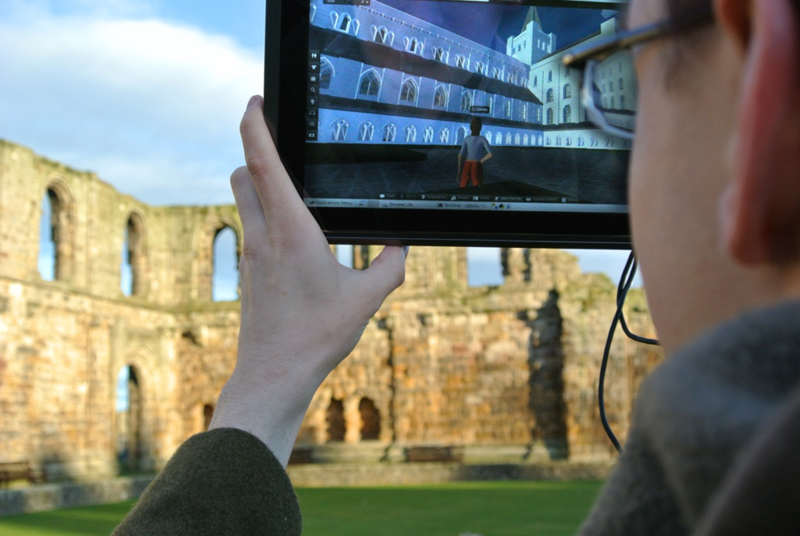 The tablet connects to a virtual world reconstruction of the site as it was earlier in history and as the visitor walks around the actual site the position of an avatar in the reconstruction mimics their movements using Global Positioning System (GPS). Digital compass and accelerometer orientate the virtual world camera angle so no manual control is required; the visitor simply holds up the tablet to anything of interest, akin to framing a photo using the screen of a digital camera. The ruined St Andrews cathedral will be used for development along with an OpenSim-based reconstruction. The first stage of VTW is the development of a framework to control an OpenSim avatar’s movement according to latitude/longitude values from a GPS receiver.